All Forums >> [Artix Entertainment Games] >> [AdventureQuest] >> [AQ Encyclopedia] >> Info. Submission >> Armours - Read the first post! Any posts that deviate from the AQ Encyclopedia Rules wil be deleted and warnings given out as deemed necesary. 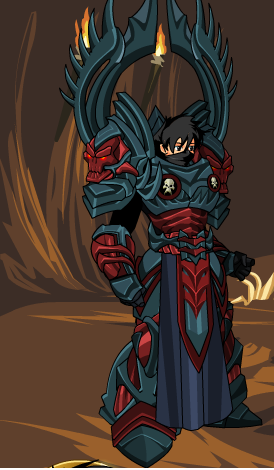 Bending the dark energies of the void are what these Juggernaut of Nulgath do best. These champions thrive in times of war and destruction. 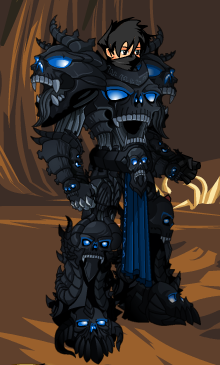 This armour is empowered by the forces of Darkness and Earth, and can Corrupt your foes with its attacks! This armour is riddled with the faces of it's last victims. if you listen closely, you can still hear their cries... AHHHH! That if should be capital. FO Earth/Darkness armour. Attack is two hits. FO Darkness armour. Attack is two hits. MC: Pretty much the same as the Zombie Master Axe. Grows more powerful as you use it - killing monsters and absorbing their souls and whatnot. You have a [# of rounds that you had the armour equipped] / [total number of rounds in the battle] chance of capturing a soul. ([# of rounds that you had the armour equipped] increases at the end of your turn.) If successful, then you increase the [soul count] by the monster's power (so normal monsters are +1; bosses are +2; etc). The bonus is +10% *[soul count]/25 damage. This applies to normal player attacks, weapon specials, and spells (spells get /2 the boost, and Magic player attacks+weapon specials get *4/3 the boost). The [soul count] resets on login. Click on the armour's chest to see how much charge you have. Human Fisher - why is Magic SP cost almost double the Melee cost, rather than *1.25 like for most other armor skills? I don't understand IMR's explanation of Big E's question. Can you clarify what that means? Does Warlord of Nulgath's Poison stack with other sources thereof? There are reports that it doesn't, for example, stack with Chimeran. @Above: It means that EleComp does weird things to SP costs. @IMR: Ah, so the thing is, Nulgath's Corruption (if not Harm) will overwrite Chimeran's poison... is that intended? For Human Fisher, shouldn't the Magic SP elecomp get *4/3? Ok nevermind. I guess elecomps just generally favor Ranged skills over Magic. FD Energy armour. Normal attack is two hits. Skill: You have three seconds in which you can click the mirror (if you want) to re-position it. You can click on it as many times as you want. If you don't click on it, then this is a normal skill. If you click on it so that the mirror is pointed towards you, then it damages you equal to 50% of the listed damage. If you click on it so that the mirror is pointed at the sky, then it does no damage. If you click on it so that the mirrors are properly aligned, then it gains a free +8.5 BTH. The skill is treated as a spell. It's Ranged if STR+DEX >= INT*3/2 or if STR/5+DEX/20 > INT/4; otherwise, it's Magic. If it's Ranged, then it uses STR/5 + DEX/20 (+LUK/2 on a LS) for damage. ^I'm assuming the skill is energy? IIRC Golem Summoner's Robes Z is meant to stay in Guardian Shop like White Knight Z. It is now removed from the Guardian Shop. Stats for the Chaos Armor's skill, because KlawdStrife asked. The skill is treated as a normal player attack, but it has its own built-in Base/Rand/BTH values. It doesn't receive effects from your weapon and it ignores your weapon Special. It's Ranged if STR+DEX >= INT*3/2 or if STR/5+DEX/20 > INT/4; otherwise, it's Magic. If it's Ranged, then it uses STR/5 + DEX/20 (+LUK/2 on a LS) for damage. It deals *1.1 damage for the whole shifting elements thing. ^Is the Elecomp written including the *1.1? Normal attack is three hits, -3 BTH lean. MC: Comes with a skill. The skill is treated as a spell. It's Ranged if STR+DEX >= INT*3/2 or if STR/5+DEX/20 > INT/4; otherwise, it's Magic. If it's Ranged, then it uses STR/5 + DEX/20 (+LUK/2 on a LS) for damage. Two hits, -5 BTH lean. ^ Tyrannochicken Rex Rider has a normal 3 hit attack, not a 2 hit attack. Light Armour, MC is a standard eleComp weapon-type skill (so eleComp lowers SP cost). FSB is a spell-type skill (eleComp boosts damage), gives up 50% Melee to attempt to inflict permanent Blind. Has a -20 save, so 70% success rate, if the mob fails it gives -(5*EleComp*Mob'sLightRes*Hits/3/sqrt(mobPower)) BtH for the rest of the battle (read, 9999 rounds). What's the lean of the Champion of Light Realm? FO? how many hits does each skill have? 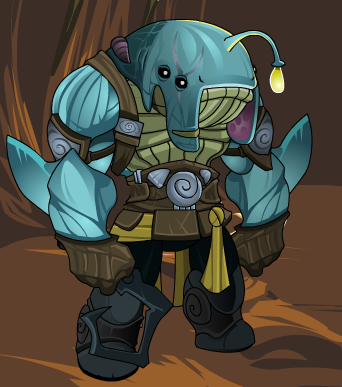 The Wyrm Knight set needs to be have location links added: http://forums2.battleon.com/f/tm.asp?m=21910016. 50% of doing its bite+slash attack. Two hits, 80% damage. 50% of doing its breath weapon attack. One hit, 120% damage, +2 BTH lean. The Lv1 version is available in the Frogzard Hunter's shop. The others are available at the end of the Frogzard Hunter Quest 1. Because of this, the Lv1 version is not upgrade-able into the Lv15 version, but all the others are. Err, like, they are able to be upgraded to the next version. They're not all able to be upgraded to the Lv15 version. Stupid English grammar. Because of this, the Lv1 version is not upgrade-able, but all the others are. 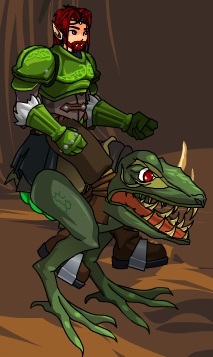 Ride a trained Frogzard into battle. Must be seen to be believed! It's not MC'd is it? You receive Armor Lean x1.125 (Phase 1). Numbers thanks to In Media Res. Description and image thanks to Carandor. Correction thanks to KlawdStrife. Attack #1 does 80% damage. With two equally powerful hits, each hit does *1/2 damage. Attack #2 does 120% damage. In addition, it gains +2 BtH and deals *85/87 damage. April 1, 2016: The armour was released. The Lv1 version is also available in the Zard Hunter Shop » My Shop. Complete the Frogzard Hunter Part 1 quest to buy higher-level versions of this armour!